The Surf To Sound event is happening this weekend in Wrightsville Beach, North Carolina (home of the Carolina Cup) and we’ve just finished the racing on day one. In the 6.5 mile “Surf To Sound Challenge” it was Jessica Rando defeating April Zilg in the women’s race, while Tommy Buday took out Larry Cain in the men’s. Distressed Mullet, who helps organise this great event, has complete coverage of the race so go check it out here (results) and here (photos). The weekend isn’t finished just yet though: Today’s race (which saw competitors paddle from the open ocean around the corner into the inlet – basically the first half of the course used in this year’s Carolina Cup) will be followed with tomorrow’s 9 mile flatwater challenge. Though I think the most interesting takeaway from the weekend is the background of the top two men’s finishers. After a super close race the whole way, the well-known paddler (and defending event champ) Larry Cain was beaten in a sprint to the line by the unheralded Tamás Buday junior (or just “Tommy”). So who is this “Tommy” guy? And what do he and Larry Cain have in common? Tommy Buday is a virtual unknown in the world of SUP, however those that follow canoeing will be very familiar with the name. The Buday family hails from Hungary (which is kinda like the Hawaii of the sprint canoeing world) but moved to Canada many years ago (Canada is another sprint canoe powerhouse). The Buday name is something of a legend in the world of high-knee canoeing (as sprint canoeing is also known) and they’ve had a long history of success at world championship and Olympic level. So Tommy’s father (Tamás Buday senior) is a 2x Olympic medalist and 4x world champion in the sport. Tommy junior followed his father’s footsteps: He competed at three Olympic games and was joined at two of those by his brother, Attila. 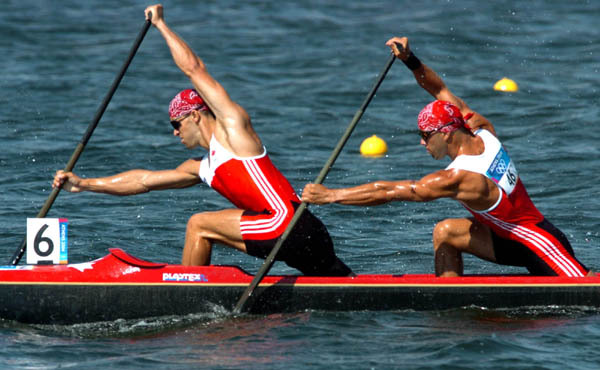 The Buday Brothers often raced together in the C-2 events (2x man sprint canoe), taking home 3x silver medals at the canoe world championships over the years. “When I was an up-and-coming sprint canoeist racing in Europe in the mid 80’s, Tamas Buday senior (Tommy’s father) was a legend in our sport and it was an honor to race against him at the end of his career. Our USA national team coach in 1988 was actually Laslo (Les) Buday, Tamas’ brother (Tommy junior’s uncle). Later in my career I was also coached by Tamas Buday senior himself. That was in 1996 when I trained in Florida with the Canadian National Team that included Larry Cain as well as Tamas junior and Attila Buday. I knew that training together with these guys was going to be what I needed to get to the next level. I learned a ton from my time with the Canadians. We trained pretty damn hard but what I remember most is the close friendships we developed. I also recall seeing both young Tamas and Atilla training in Florida when they were junior paddlers way back in 1991/92. I thought to myself back then “Wow! These guys are going to be great one day…” and sure enough, that “one day” came just four years later, when the Buday Brothers made their Olympic debut for Canada at Atlanta in 1996. When I heard Tommy junior was taking to SUP in the Quebec province, I was both excited and honored to build him a good paddle. It appears from his Surf to Sound race attire (photo below) that he’s vying for the “Captain Quickblade” nickname that Larry so cleverly calls me from time to time. So there you go. The canoeists are coming. First it was Larry Cain and Jim Terrell, now we’re seeing the next generation discover the parallels between C-1 and SUP-1. Just don’t tell the rest of Hungary’s paddling community about stand up paddling… Hawaii, California and Australia already have their work cut out holding off the Tahitian outrigger warriors, I don’t think they can fight this war on two fronts. But seriously – I think it’s awesome to see the crossover from other paddling sports and I sincerely hope it continues. Prone paddling, outrigger, kayak, surf ski and now high knee canoeing: Stand up paddling seems to be the common sport in the middle that draws athletes from all other paddling disciplines.